About fifteen years ago, Lea and I decided we needed to make some changes in our lifestyle. Exercise was never in our time schedule, but it was time to start. We joined a Fitness Center, which eventually morphed into BeFIT. It was a decision we were never sorry over. Neither of us wanted to look like Charles Atlas, but rather we wanted to be able to carry on with our two favorite activities, Cruising and Scuba Diving. The addition of two Golden Retrievers five years ago helped with the aerobics, as we walk them twice a day for at least thirty minutes. At 75 and 74, we are proud to be the “oldest” in the gym, and are looking forward to maintaining that position for many years to come. Justin, Jeremy and Dom provide the tools and encouragement which are needed to keep us motivated. 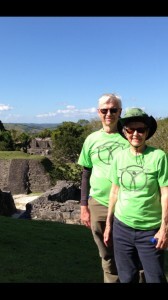 Having just returned from a cruise to the Western Caribbean, during which we had three scuba dives and climbed a Mayan ruin, I would say we are achieving our goals. 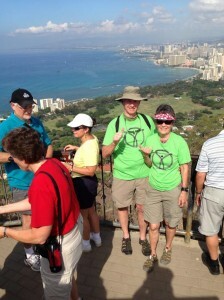 We have also recently climbed Hawaii’s Diamond Head Crater, and the Lighthouse in Ponce Inlet. Our intention is to carry the “BeFIT” logo to as many parts of the world as we can.